The last quarter of 2010 wasn’t a great time for WHS enthusiasts, with HP dropping the MediaSmart server range and Microsoft removing Drive Extender from Vail combining to dampen the spirits of all but the most diehard WHS fans. 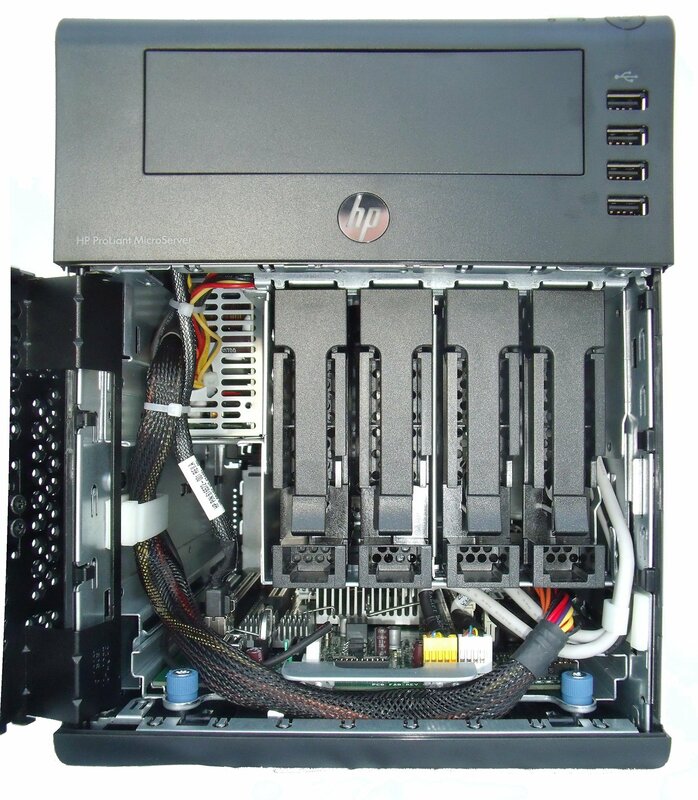 HP have thrown us as all a partial home server lifeline in the shape of the ProLiant MicroServer. Designed primarily for the small office rather than the home, the ProLiant looks to be a worthy replacement for the MediaSmart server hardware. 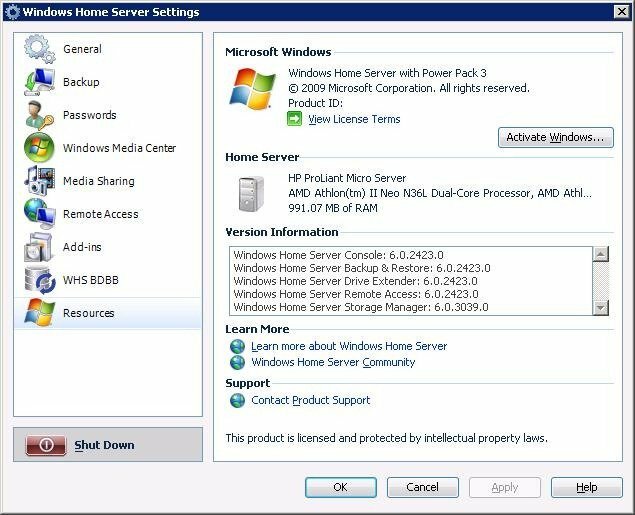 I say hardware, as the ProLiant doesn’t ship with an operating system, and a regular copy of WHS from Microsoft won’t come with all the extra bells and whistles that put MediaSmart servers head and shoulders about all the other Windows Home servers. Looking at the hardware, the ProLiant MicroServer is a compact and sturdy box, standing a little shorter and wider than a MediaSmart server at (HxWxD) 10.5 x 8.3 x 10.2 in (26.7x 21.0 x 26.0 cm). Finished in matt grey and black, the front panel plays host to four x USB 2.0 ports, HDD and network activity lights, and the power button. Also we find a big illuminated HP logo that will change colour to indicate the servers status. Unusually for a home server (sorry this isn’t a home server is it) it has more USB ports on the front than the back. I would imagine the idea of this is to allow users in a busy office to connect and disconnect USB hard disks without having to disturb the server by fishing around on the rear for spare sockets. The front is completed by an optical drive blanking plate and a lockable front door. Opening the front door reveals the four SATA drive caddies, and exposes the motherboard which can easily be removed by undoing the two light-blue thumbscrews at each side. The MicroServer ships with a 160gb 7200 rpm Seagate disk (I didn’t realise they still made them that small anymore) inside a simple design drive caddy, which feels secure and robust enough to hold the disk securely in place inside the server. 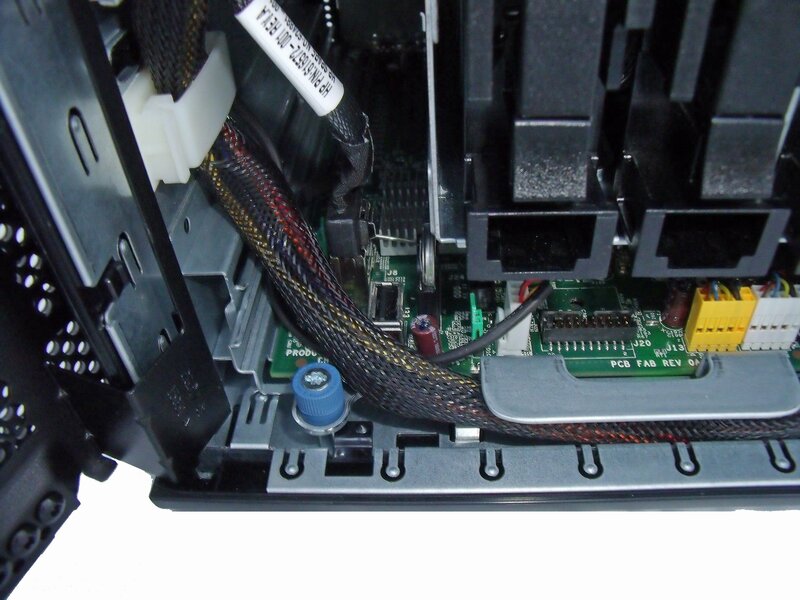 Unlike the screwless caddies HP used on the MediaSmart, disks need to be fastened in place with screws. One very good feature is the location of these screws. Instead of supplying them in a plastic bag, HP have bolted them and their torx key in place inside the front door. 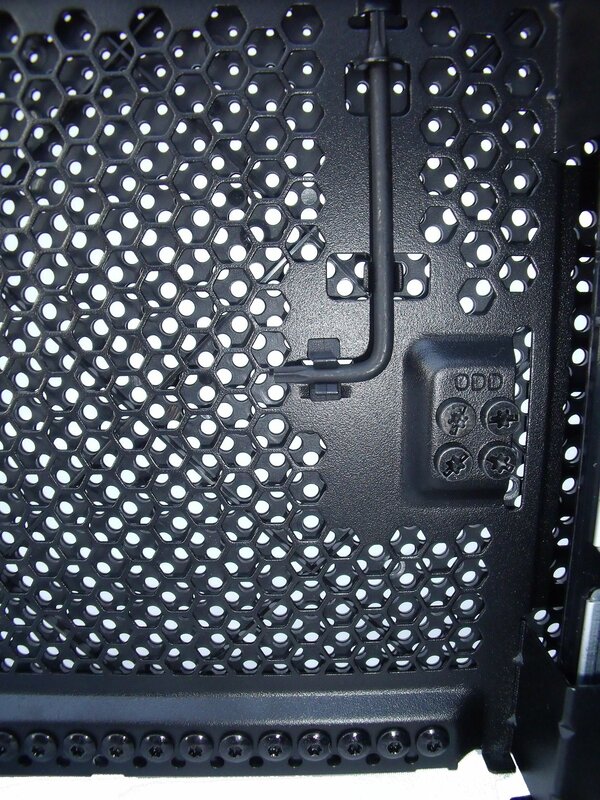 You never have to scratch around looking for the screws, as they will always be securely located within the server. A nice touch, and one that shows that HP have paid attention to the design of this little server. Finishing off the hardware tour around the back is the gigabit Ethernet port, eSATA, VGA, two x USB 2.0 ports and of course the power input. A large fan quietly keeps everything cool. Internally the server uses a 1.30GHz AMD Athlon II Processor Model NEO N36L and the motherboard is based on an AMD RS785E/SB820M chipset, 1gb of DDR3 is supplied, along with the previously mentioned 160gb hard drive. This all sounds a bit limited, but remember that this is a server and these specs are perfectly adequate to power a small business or simple home server. The 1gb or RAM is provided on a single stick, leaving an additional slot available for you to add extra RAM. By upgrading both slots, a maximum capacity of 8gb is achievable. 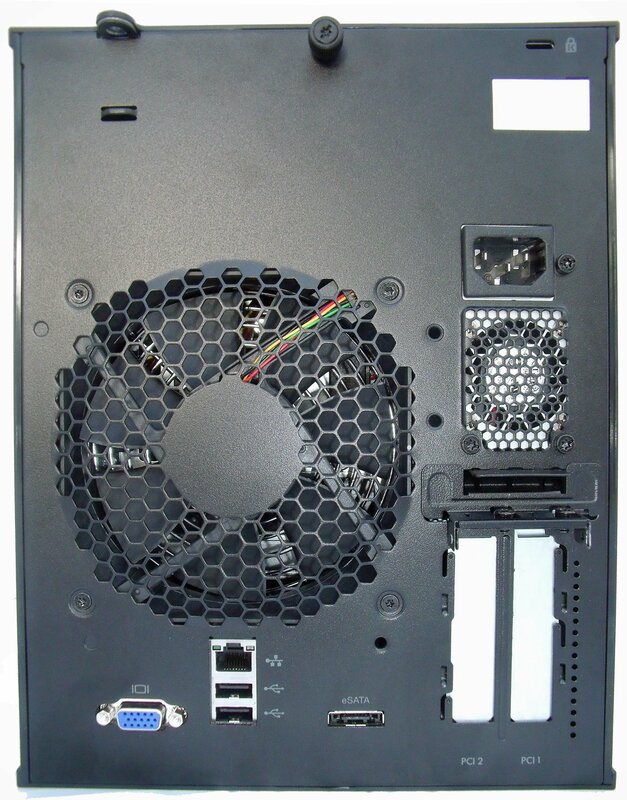 We also have two half height, half length PCI-e expansion slots, one x16 and the other x1. Possible uses for these in a server could be anything from installing extra network cards to turn this into an Astaro Security Gateway appliance, or adding graphics and TV card for media PC duties. Having these available gives us plenty of flexibility for potential uses for the ProLiant. 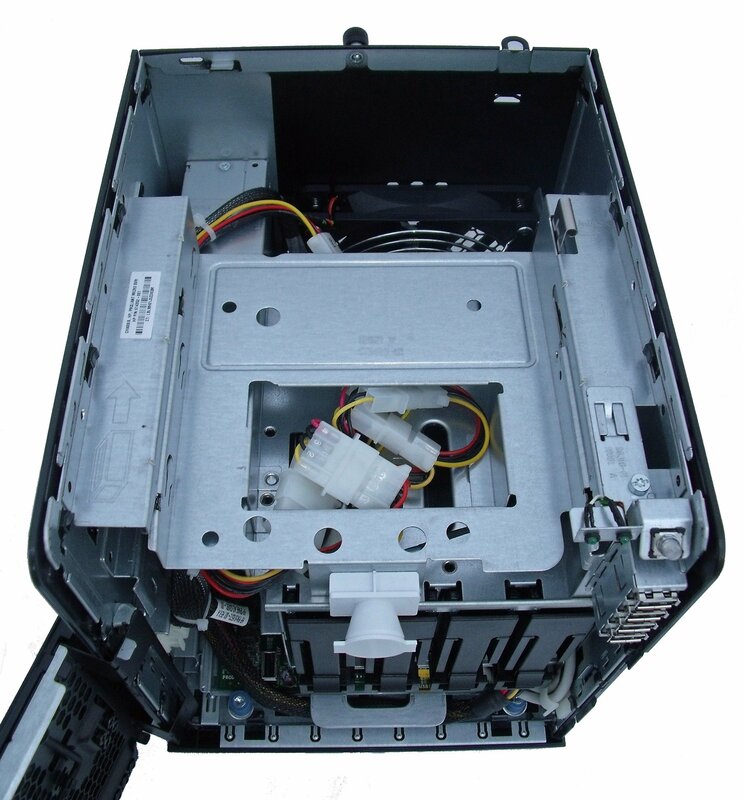 There is a thumbscrew on the rear that allows the removal of the top of the server giving access to the empty optical bay. Although the server doesn’t ship with an optical drive, installing one looks to be a pretty straightforward. Remember the hard disk screws inside the front door? Well look to the center of that picture and you will see four screws labelled ODD (Optical Disk Drive I imagine). 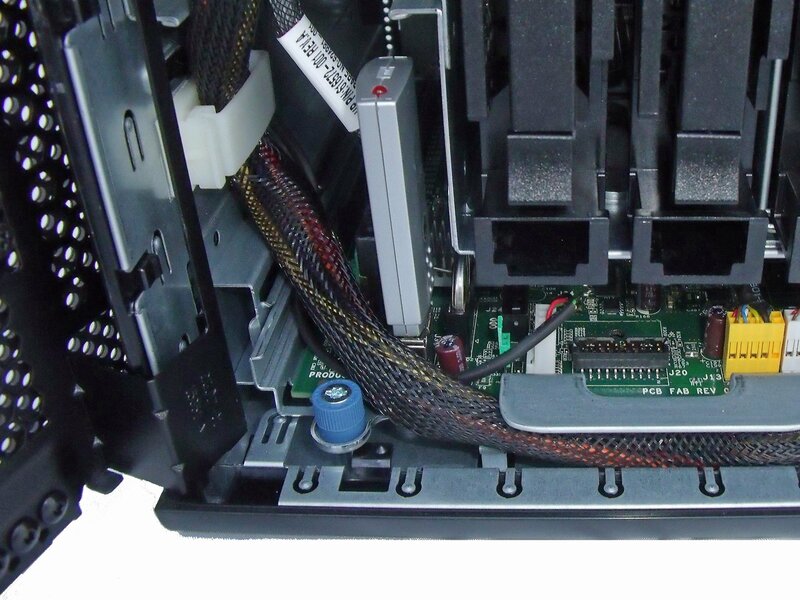 These screws are slightly thicker than the hard disk screws, and allow a half height optical drive to limbo under the status lights and securely slide into empty drive bay, connectiong up to a spare SATA port on the motherboard. Finally power consumption when powered down is 10w, which rises to around 35w when in operation with its single supplied hard disk. As mentioned earlier, the ProLiant Microserver doesn’t ship with an operating system, but luckily there is plenty of free or paid-for operating systems to choose from. I clearly had to install Windows Home Server given the nature of this website, and one thing to watch when installing WHS v1, is that the BIOS default SATA configuration is AHCI, which will need to be switched to Native IDE. With that done, WHS installed without a hitch. Well, not quite without a hitch as there is no network card driver available on the WHS installation disk. I tracked down a suitable driver on the HP support web site called cp013021.exe which seemed to do the trick for me. You will also find that the WHS installation won’t find a driver for the VGA or the SM Bus Controller either, but not having these drivers causes WHS no problems in operation. 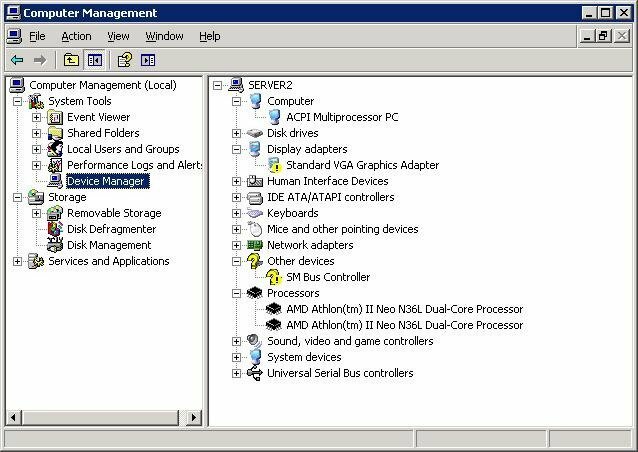 For basic WHS service, the AMD Athlon and 1gb of RAM performed perfectly well, but power users who require plenty of applications running might want to consider installing more RAM as 1gb doesn’t really go very far if you stray from vanilla WHS. 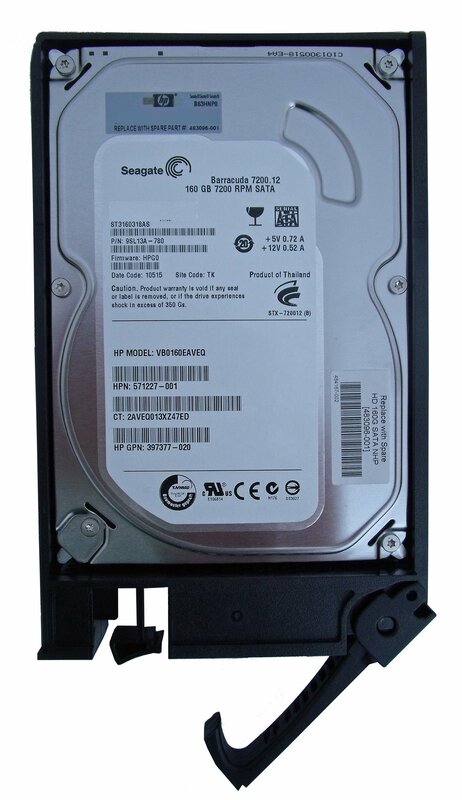 If you don’t want to run to the extra cost of buying WHS, then this server is perfectly at home running free server software like FreeNAS or VortexBox (although this is going to need an optical drive). The inclusion of a motherboard based USB 2.0 port makes the ProLiant MicroServer a perfect choice for a flash memory embedded installation of FreeNAS. This option installs the embedded OS onto USB flash memory, and leaves the hard disks dedicated to storage. Quick, simple and it is almost like that USB port was installed specifically for FreeNAS. FreeNAS works very nicely on this server, and could be a perfect solution for some users. Finally I installed Windows 7 64-bit onto the ProLiant to see what its performance would be like as a desktop PC or a Windows Media device. 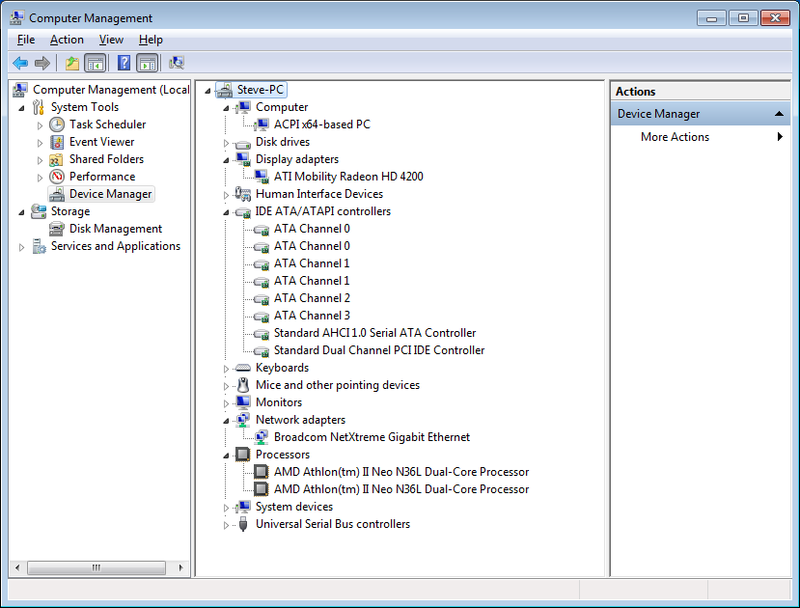 Unlike the installation of WHS, Windows 7 64-bit had no problems locating and installing all the drivers it needed for the ProLiant’s hardware. The server performed reasonably well under Windows 7, although I found the redrawing of the desktop and screen updates to be a little laboured and sluggish, but otherwise everything seemed acceptable as a low-end desktop PC. I would expect these graphical shortcomings to be resolved by adding a proper PCI-e graphics card and some extra RAM, should you wish to use this as a desktop PC. I mourn the passing of the excellent MediaSmart range, but HP have given us a worthy hardware replacement in the form of the ProLiant MicroServer. 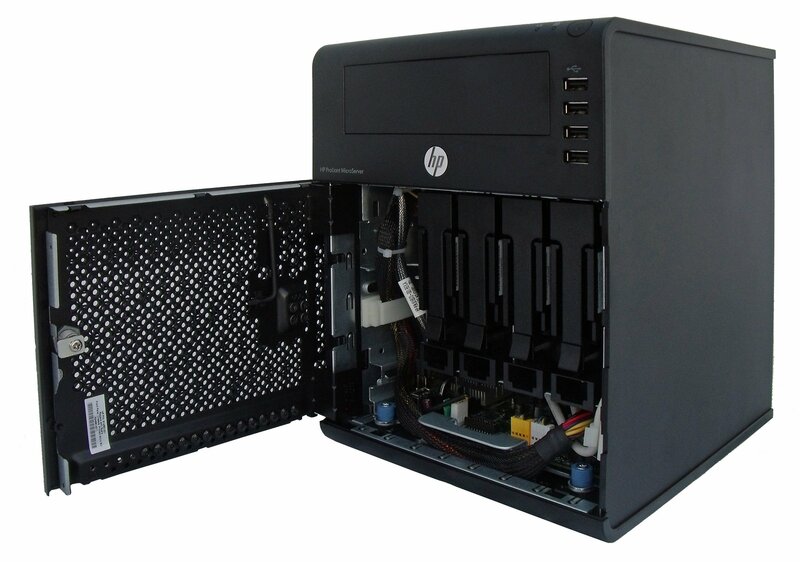 With the impending release of Vail or Windows 7 Home Server, consuming very little power, running cool and silently, the HP ProLiant is well placed to offer a home server enthusiast a solid and cost effective platform to house their server. 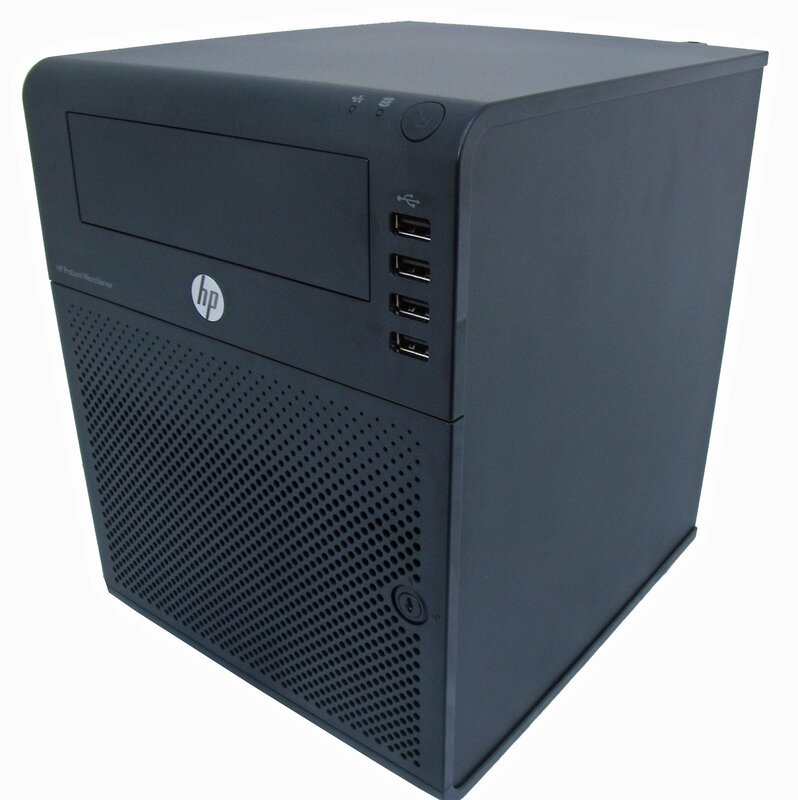 If you are in the UK, and are very quick, then HP is currently offering £100 cash back on this server, with prices around £250 (£150 after cash back) this is a stunningly good deal if you are able to get one in time. These do look like fun to play with. Unfortunately, many sites are now reporting them as discontinued. I’m disappointed I didn’t pull the trigger when they were going for £200! Does anyone know anywhere that has them in stock at under £240? Great stuff. Thank you for the awesome review.. This seems like the first real media smart replacement, I have a question, how did u install WHS, I assume through a USB optical drive. Did you have any trouble making that work or is it plug and play? And what hardware did you use? …and what about CPU performance? (for example vs Acer H340 o HP Data Valut X510 performacne) Is NEO platform sufficient to all Vail features? I installed WHS via USB stick. you can download a utille to format it the USB stick so you computer can search for boot recored. search google for for more info. Also you need to go in the BOIS (F10) and change SATA harddrive to IDE other wise you get Blue screen of death part way thought the install. Have one of these well built boxes, but now need to get the OS in. 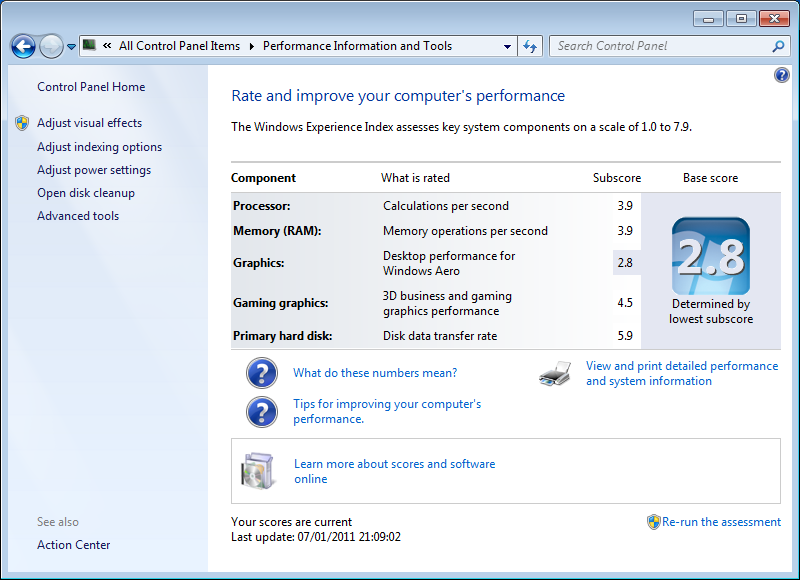 If loading Win 7 Pro do I need to change the BIOS settings and is the ECC memory OK if I get another 1GB please? I’m having fits installing anything onto a HP Microserver I recently purchased. FreeNAS refuses to see the USB stick inside, and Server 2008 R2 won’t partition any of the hard drives I put into it. Yes, I’ve been changing the BIOS settings to everything imaginable to try to get it to work. But it just wont. HP kills me with the non-standard hardware they use so often! I’ve had no problems at all with WinPro7 which is much cheaper than MS Server 2008. I put in 2 2TB caviar Greens in RAID1, partitioned for the OS, and bought 1GB extra ECC memory. Data transfer rates of 35 – 50+ MB/sec and sustained Acronis back up of 125GB in an hour vs 8 hrs with an old Zyxel NAS220 in RAID1. seems to do Resume too. It would have been nice to thave the OS on a USB stick but it was too much trouble. Yep, tried every setting for hard drives in the BIOS. First with the shipped BIOS, then after an upgrade to the BIOS. Not to mention the BIOS update was a pain, as I had to set it up on another machine to a USB stick first, which was not very intuitive. Funny that the only drivers from HP’s support site are for Windows 2008 R2 and nothing before that or otherwise. I’ve not tried anything from AMD yet. I thought though to be ACHI compliant it’d have to answer to the OS calls without a driver?!?! This machine so far makes me feel as if it’s a mistake instead of a serious attempt. No wonder they sell them so cheap! HP continues to disappoint me, one server at a time. I am having the same issues as Nargg, cannot install 2008 R2 I get parition errors and the instlal disc shows that it cannot continue to the next phase of install after copying the files and uncompressed them, does 100% then says that error. Its crazy, I have tried it with 2 discs in a mirror and it works fine, 4 discs however and it wont run all 4 drives are the same 1TB drives I just dont get it. lightning has hit mine and only the cpu and motherboard seems to be damaged, tested all the other parts independently and they work fine, I used my little micro server as a media player with an extra screen card and 8GB ram and am a little lost without it, is it possible to replace the motherboard and cpu with any micro atx form factor motherboard and a cpu? 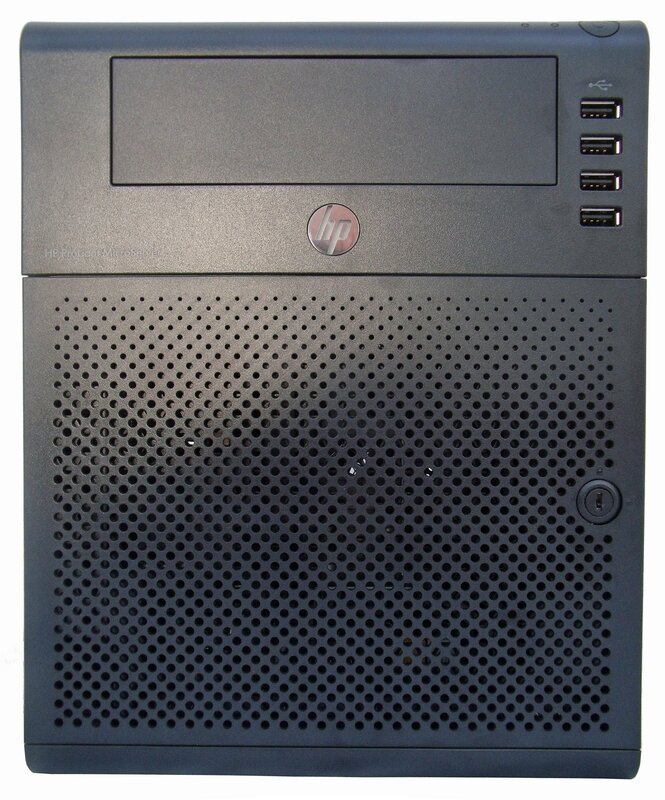 or would I have to buy a whole new micro server again?